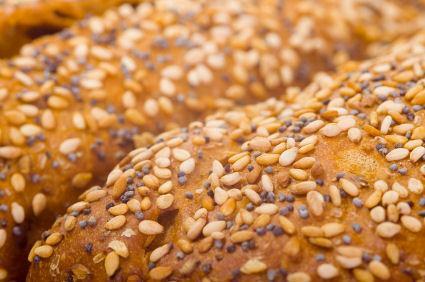 Whole grains are a big part of the American Detox Diet. The American Detox Diet is a plan designed to cleanse the body of impurities and help you lose weight at the same time. Designed by Alex Jamieson, a holistic health counselor and fiancée of Supersize Me guinea pig Morgan Spurlock, the plan helped him detox and lose 30 pounds after his 30-day McDonald's binge. At the end of the movie Supersize Me, Spurlock had gained nearly 30 pounds, increased his cholesterol level astronomically and caused damage to his body in other ways. Jamieson only allowed him to try the McDonald's experiment because he promised she could take over his health when he was done. This detox diet was born from the plan she used on him to get his weight and his health back to normal. The idea behind the diet is that most things in the normal American diet have additives and ingredients that are actually toxic to the body. In particular she looks at the overuse of high fructose corn syrup in just about every product under the sun as a major problem for the health of the nation. Unlike other detox diets, which are performed for a limited period of time and often involve fasting, the American Detox Diet is more about long-term lifestyle change than a short process of cleansing and detoxification. Jamieson recommends things that should be added to the diet (such as much more water) and things that should be eliminated, like high fructose corn syrup and fortified white flour. She also recommends a move that many in modern American households might not want to follow: getting rid of plastics. She argues that the chemicals in plastics increase toxicity in the body since they are made from petroleum. Cutting out caffeine, alcohol, refined carbs and sugar are also on Jamieson's list of ways to improve your health. She uses medical research to explain why these products should not be consumed, and in some cases offers alternatives. Because Jamieson is a vegan, the recipes in the back of the book-there are nearly 100-involve no meat or animal products. The book provides a tasty introduction to veganism for people who might not have considered meals without meat before. Even if you aren't interested in giving up meat entirely, the Great American Detox Diet provides ideas and tips for healthier eating no matter what kind of diet you follow. The most important thing to know about this diet plan is that it isn't really a diet in the conventional sense of the term. While there is an eight-week plan built into the book, it is really eight weeks of transition to a new life that will incorporate all the changes you've made into a permanent lifestyle. The book includes guidance on how to ease this transition with stress reduction techniques and exercises that will reinforce the mind-body connection. Many people will find this book alarmist and too restrictive in its all or nothing approach to health. Additionally, while Spurlock lost weight on the diet, the book is not set up like a weight loss plan. The recipes don't include nutritional information or even serving sizes, making it difficult for a dieter to judge the relative healthiness of a particular menu. Still, for people who are interested in making a major change in their health and lifestyle that they are willing to stick with long-term, this book can offer a lot of guidance on how to detox from the standard American diet and begin consuming a healthier diet based on whole foods and less toxic choices. Even if you don't follow the program to a T, limiting those things that Jamieson suggests can still help you feel better, give you more energy and, yes, even help you lose weight. Even if you still use plastic.